Recovering from a disaster is not only very stressful and time-consuming, but also quite expensive. Floods, fires, and mold can cause extensive structural damage to your property and affect the contents of your home. Cleaning up the aftermath, repairing the damaged structural elements, restoring your home to a good condition, and replacing your ruined household items and personal belongings will certainly cost a lot of money. Your homeowner’s insurance will cover most of the restoration costs, of course, but certain types of damage may not be included in your insurance policy. In such cases, you will have to pay for all the repair works and any other required restoration procedures. To help homeowners and business owners in Palm Harbor, FL, who have experienced damage that is not covered by their insurance policies or simply prefer not to file a claim, ServiceMaster 24 Hour provides disaster restoration services through the new FlexServ program. 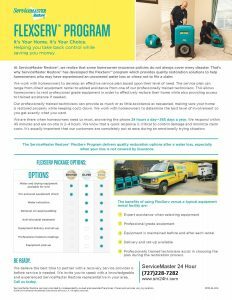 Under this program, we offer equipment rentals and partial professional assistance as a viable way to keep down the restoration costs.The special program covers dehumidifier rental, air scrubber rental, air mover rental, drying equipment rental, water damage equipment, water removal equipment. If you want to take advantage of our FlexServ program, our technicians will work with you to create an efficient cleaning and restoration plan. Then, we will rent our specialized restoration equipment to you and will provide expert assistance whenever necessary to get the job done effectively. Once we determine how much of the work you can handle yourself and how much professional assistance you are going to need, we will make every effort to keep the costs at the minimum possible level. Assistance and planning from professionally trained technicians. If you experience damage to your property in Palm Harbor, FL that is not covered by your insurance policy, contact ServiceMaster 24 Hour to discuss our FlexServ program. We offer efficient and affordable restoration solutions in the form of equipment rental and professional assistance to help you recover from a disaster. You can reach us at (727) 228-7282, 24 hours a day, 7 days a week, for more detailed information about our FlexServ program.